Why choose Scrumpy Soap Co. - Scrumpy Soap Co.
* All natural. Only natural ingredients, sourced when ever possible from the local area, are used. This includes extra virgin olive oil, Australian Organic Hemp seed oil, honey, herbs, botanicals, fruits and goats milk. We purchase organic ingredients when possible. * Made through our old fashioned soap making process using olive, coconut, castor and many other luxurious oils including Australian Organic hemp seed oil. This process ensures all the natural goodness from these products are retained including the skin-loving glycerin. * Palm oil free. 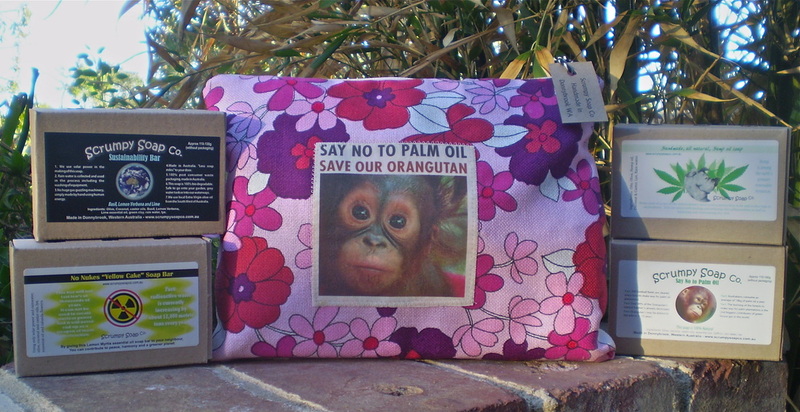 At Scrumpy Soap Co. we don’t use palm oil. Ever. * Good for sensitive skin as it contains glycerine and no synthetic fragrance or other artificial additives. * Additive and preservative free. * Free from artificial colours. Our colours are derived from clays and herbs. * Contain no hardeners, lather enhancers or sodium lauryl sulphate. * Environmentally thoughtful, using solar power, rain water and working towards being a zero waste business. * Suited for most skin types in either scented or unscented. * Gift box made using a 100% recycled cardboard that is re useable. No excess packaging and minimum waste. * One single soap bar has taken 4-6 weeks to lovingly create in small batches, before being ready to send out and they last much longer than other hot process or store bought soaps ,provided they are kept dry between uses. Our Cold Process soaps are as a result are the superior alternative to store bought chemical ridden soaps that are also affordable for everyday use. * Good for you and Good for our planet.